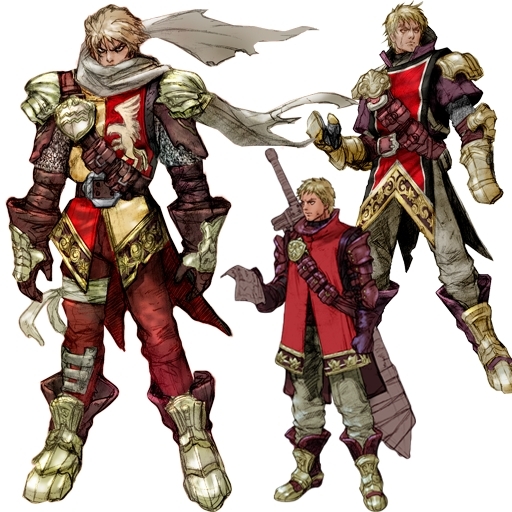 Physical Description (Or picture): Alric has short, parted blond hair and a well-built physique, light blond facial hair on his features. Over the years, and most specifically while getting accustomed to his powered suit and plate mail, Alric's gained much more muscle to his form, standing tall and standing out among normal physiques. He usually wears red and gold chain mail, though he's able to fight in plate mail. Powers and Special Abilities: Alric is a former paladin, but only in title rather than true beliefs and powers; thusly, he has the power to heal grievous injuries via direct touch, or moderate injuries with only line of sight. The curative spell is holy in nature, and can be used to either repel undead and purely evil enemies potently. He can also fully turn undead, causing them to run in terror for a while. Alric possesses a number of new paladin abilities he's learned on his travels with the Mark I - this includes the ability to produce a 6x6 yard consecrated circle, damaging and repelling all undead and evil creatures within it. He can only produce one of these at a time. He can detect evil from varying distances away, though he cannot pinpoint precisely who or what emanates it - only the general direction and amount of it. Alric is also a skilled and seasoned surgeon and medic, allowing holy magic to interwine with basic medicine to perform basic and advanced medical care. Gained during his travels as the Mark I's combat medic and paladin, Alric Gainsborough gave up his plate mail for a powered suit, blue and green in color, much the opposite of his standard non-tech red and gold. It gives Alric much more strength and the ability to fly, as well as the ability to focus his holy energy into a powerful consecrated energy beam from his palms. This takes time to charge. The powered suit is designed to assemble itself around his body; the helmet gives him an HUD and greater sensors and visibility, on par with most other mechs. While in the powered suit, he gains resistance to unholy damage and status effects (these protections are enchanted). Alric currently wields Retribution, a sledgehammer maul with holy runes, particularly potent against demons and the undead. In his powered suit, he can swing it one-handed. It magnetically sticks to his back when in powered suit mode. Despite his appearances and breaking various codes, Alric also carries a pistol-grip shotgun, the same holy runes etched into the barrel. It seems to have a name, but he won't tell it to anyone (yet). Weaknesses: An overwhelming amount of evil (especially undead) can cause Alric to go nearly berserk - only direct intervention by allies can truly stop him from attempting to overcome despairing odds, if presented. To him, all evil has to be vanquished SOMEtime - it may as well be now. Alric's healing powers require line of sight, which is an issue when his other crewmates will rarely stand still - his gauntlet in both powered suit and plate mail form can come off easily, as direct healing requires his hand to be free, but it still takes a turn and leaves his hand vulnerable to do so. Alric Gainsborough's powered suit is not EMP protected. Alric also *cannot* refuse or resist a being in need of his assistance. Background (Please keep this semi-short - the best way to find out about a character is through roleplay): A former paladin still in possession of his holy powers, Alric Gainsborough (no relation to Aerith!) has wandered for some time, righting wrongs and doing what he can to get back to his home dimension, though he doesn't exactly remember too much of it. Having given up on getting back home, Alric has decided to throw his considerable abilities as a healer towards aiding Sokai Hemmingway on the Mark I. He stands as one of the few Mark I crewmembers to follow her. ROBOPALADIN is approved through the character freeze, since he was a Mark I character and was approved all the way back when!